confines photons inside MC, and makes them strongly interact with matter. This results in the appearance of new modes - polaritons on the MC emission spectra. and dynamically developing domain which continuously attracts scientists. - Observation of Bogoliubov spectrum. - Observation of optical spin Hall effect. 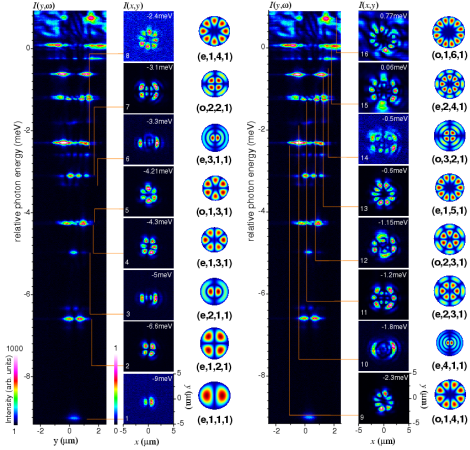 - Experimental measurement of sound velocity in polariton superfluid. - Explanation of experiments by appropriate theoretical model. Optical measurements are conducted at nitrogen or helium temperature with the sample mounted strain-free in a bath cryostat. Two different optical excitation configurations are combined in a setup. Namely, a CW diode laser and Ti:Sapphire mode-locked laser. 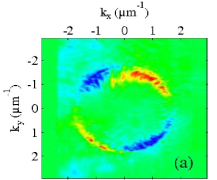 Excitation is spatially or directionally focussed on the sample surface, and imaged by an aspheric lens of 0.5 NA (L3 in Fig.1) with a wavevector range of |k|<4 um, providing a spatial resolution of about 1um. The emission is detected spectrally integrated in the real or reciprocal space using video CCD cameras. For spectrally resolved detection, the emission is imaged in real or reciprocal space into the input slit of an imaging spectrometer. Two-dimensional images are acquired by translating the image across the spectrometer slit using lateral movements of two lenses. Please see links to the supporting materials in following sections for more details. Other techniques used include FIB,SEM,AFM,high resolution optical microscopy(DIC), chemical etching, MBE. Physics of the microcavity polariton condensate is successfully reproduces using Gross-Pitaievskii (GP) equation [1TM], or two coupled GP equations [2TM] if condensates' polarization is taken into account. Simulation for a GaAs based microcavity sample in strong coupling regime was performed during this work. Density dependent blueshift of the single condensate due to exciton-exciton repulsion was found together with linearisation of dispersion following Bogoliubov prediction for weakly interacting bosonic condensate. Results of a simulation in a form of a movie are here, individual data is shown in Fig 1. Polaritons are injected resonantly with a pump detuned by +1meV from ELP(k=0). After 15ps when quasi-equilibrium is reached, weak probe is switched on. Lower polariton (LP) branch dispersion dependency on pump power is shown for power below and above condensation threshold in a) and b) respectively. JZ thank Tim Liew for help during work on this topic. Fig 1. Polariton density as a function of energy and momentum in linear grey scale. We observe anisotropy in the polarization flux generated in a GaAs/AlAs photonic cavity by optical illumination, equivalent to spin currents in strongly coupled microcavities. Polarization rotation of the scattered photons around the Rayleigh ring is due to the TE–TM splitting of the cavity mode. 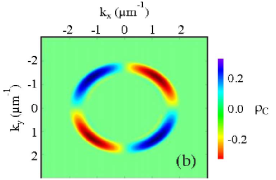 Resolving the circular polarization components of the transmission reveals a separation of the polarization flux in momentum space. These observations constitute the optical analogue of the spin Hall effect. Polariton states bound to natural defects in planar GaAs/AlAs microcavities grown by molecular beam epitaxy were investigated. The defect types relevant for the spatial polariton dynamics in these structures are cross-hatch misfit dislocations, and point-like defects extended over several micrometers. We attribute the latter defects to Ga droplets emitted occasionally by the Ga cell during the growth. These defects result in a dome-like local modulation of surface, which is translated into the cavity structure and leads to a lateral modulation of the cavity polariton energy of up to 40 meV. The resulting spatially localized potential landscape for the in-plane polariton motion creates a series of bound states. These states were characterized by spectrally resolved transmission imaging in real and reciprocal space, and reveal the spatial potential created by the defects. Interestingly, the defect states exhibit long lifetimes between 10-100 ps, which we attribute to a spatially smooth confinement potential. Moreover, we investigated these defects using FIB/SEM machine to cut defects open and expose the modulation of epilayer, see 2ND. Fig 3. (on the right) Real and energy resolved transmission from a natural defect in the 1st,2nd,4th and 5th column. In 3d and 6th column, real space distributions of corresponding squares of Mathieu functions labeled by their parity ('e' even, 'o' odd), radial (n) and angular (m) order. Semiconductor heterostructures consisting of alternating binary-alloys with zincblende structure grown in  direction which have moderate lattice mismatch(<2%) accommodate stress by the development of a cross-hatch dislocation pattern. In GaAs based planar microcavities grown by molecular beam epitaxy (MBE), cross-hatches create a potential landscape for exciton-polaritons, causing scattering and localization [1SC]. Fig 4. Real space (1mm2), time resolved transmission through microcavity. Parametric scattering of microcavity polaritons, similarly to parametric processes in non-linear crystal, is a consequence of energy-momentum selection rules for polaritons in microcavities. Parametric scattering was observed in strongly coupled GaAs/AlAs based microcavity. Polaritonic dispersion for "ghost branches" are symmetrical vs the pump laser energy and momentum. Fig 5. (on the right) Spectrally and directionally resolved emission from strongly coupled microcavity with LP, LP*, MP and MP* branches for two pump energies and wavevectors.